Marine services & boat design company located in Florida. We strive to provide exceptional yacht and boat design and we pursue this goal with a real passion. When it comes to refining a vessel we are with you from the concept to launch day. Boats that completely fulfill their working requirements while being stylish, practical, and above all great performers in real life conditions are what we do best. Let us create your perfect craft for you. 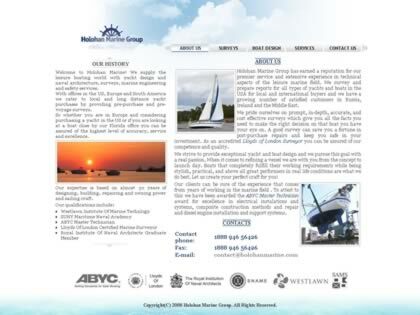 Web Site Snapshot: If available, above is a snapshot of the Holohan Marine Group web site at http://www.holohanmarine.com as it appeared when this site was added to the directory or last verified. Please Note that Boat Design Net has no involvement with the above web site; all content and images depicted in the above thumbnail are the property and copyright of Holohan Marine Group unless otherwise noted on that site. Description: Marine services & boat design company located in Florida. We strive to provide exceptional yacht and boat design and we pursue this goal with a real passion. When it comes to refining a vessel we are with you from the concept to launch day. Boats that completely fulfill their working requirements while being stylish, practical, and above all great performers in real life conditions are what we do best. Let us create your perfect craft for you.